Louisville High School Final Model United Nations Conference Breaks School Records! Final Model United Nations Conference Breaks School Records! Six members of Louisville’s Model UN team competed in the rigorous form of a mock UN Security Council on the pressing issues of the Rohingya Muslim oppression in Myanmar and the Houthi rebel uprising in Yemen. The team placed second overall at the conference and brought home the outstanding delegation trophy! Felice Fisher (’20) and Tyler Williams (’18) competed in their first conference at the novice level, talking solely on the Myanmar topic. Justine Chou (’19) and Marie Ardy (’20) competed novice, and talked on the same topic placing at second in their committee, winning the outstanding delegate award. Ronnie Nickols (’19) and Maya Beesley (’20), with the research assistance of Abbey Lukas (’19), competed at the advanced level and spoke on behalf of both topics. 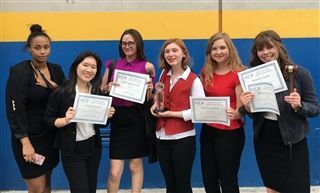 They won the research award, amidst placing first overall, achieving the best delegate award at the advanced level for the first time in Louisville history. With the combination of these scores, Louisville as a whole placed second overall at the conference and brought home the outstanding delegation trophy for the first time. With these successes the team hopes to be able to host Louisville’s first regional conference in the near future.